Are you searching for a Kyocera copier and learning there’s an overwhelming amount of options, models, and features? All Kyocera copier costs are different and depending on your budget and office needs; you might face a few challenges while choosing the best one for your business and employees. 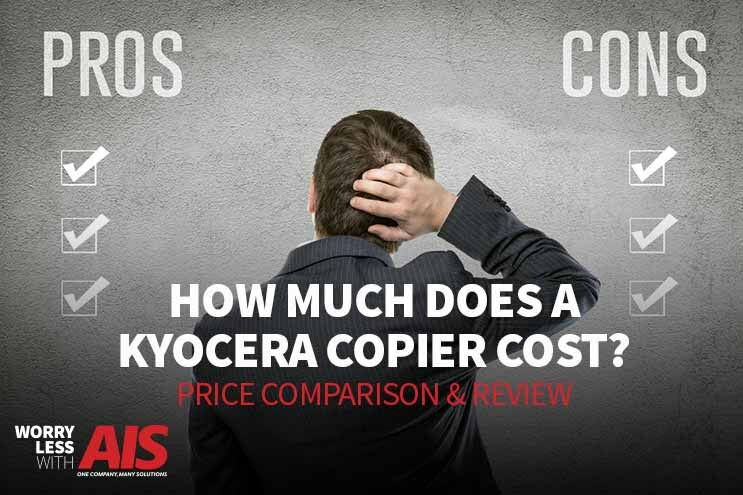 The costs associated with Kyocera Copiers range in price, depending on your specific business needs and goals. While some Kyocera Black and White Laser Printers range between $300–$2,500, other Kyocera Multi-function Color Copiers and Printers range between $7,000–$25,000+. There are a few key considerations to keep in mind while you browse around, and just like purchasing a car, the more requirements you need or want, the easier time you’ll have throughout your buying process. Of course, you can visit all of the manufacturer websites and scroll through all of their products. You’ll notice, some have prices, and some don't.You can search on other non-manufacturer sites such as eBay or Amazon if you're looking for a smaller or simpler black and white or a color MFP. Or maybe you’re looking for a used piece of equipment. As you review different Kyocera copiers online, it’s also important you keep in mind that you don't have to buy a copier outright. Leasing a Kyocera copier is a great option that replaces a large, up-front capital expenditure, with an easy-to-manage monthly payment. This helps cut down on some of the upfront costs of purchasing a brand new Kyocera copy machine. Over ninety percent of the copiers we provide are leased by our clients today. We understand the process of purchasing office equipment for your business isn’t the easiest task to do, so we’re here to relieve some of your frustrations. Follow us as we take you through the costs, features, and benefits of Kyocera copiers and how these machines can help increase office productivity, and decrease employee downtime. The first set of office copiers we’ve categorized are the Black and White (B&W) Kyocera P3045dn / Color Kyocera ECOSYS P5026cdw. The ECOSYS P5026dw ranges in price from $300–$2,500, and prints 27 ppm (pages per minute, or print speed) in color or black and white. This color network printer works best for smaller workgroups or individual users with frequent print needs. With a quick, 29 second warm-up time and duty cycle of 65,000 pages per month, it's a perfect fit for daily printing tasks. Do you only need to print in black and white? The ECOSYS P3045dn prints at 47 ppm at 600 dpi (dots per inch), and can print up to a “fine” quality of 1,200 dpi for precise output needs. A standard feeder tray holds 600 sheets, helping meet a variety of your needs of printing envelopes, thick or thin paper, coated paper, banners, and labels. Security options and “On-the-Go” mobile printing enhance your data security infrastructure while improving productivity. As you can see, this printer might be small, but it sure is mighty! Another great Kyocera copier to take a look at is the B&W Desktop MFP Kyocera ECOSYS M2635dw. This copier ranges in price from $800–$2,100. This black and white MFP (multi function printer) is designed to maximize budget and functionality, and it’s easy-to-use and reliable (for a low total cost of ownership – less maintenance). Like the copiers mentioned above, the M2635dw includes On-the-Go printing and scanning, allowing everyone in a workgroup or small business to be productive from anywhere. The Color Kyocera ECOSYS P6130cdn office copier also ranges in price from $800–$2,100. This Kyocera copier is perfect if you don’t have a large office space to host it. You can easily keep this copier on a desktop or in a corner. You or your workgroup has access to 32 ppm output in black and white or color. Optional wireless printing and Apple AirPrint capabilities increase productivity without being tied down to the device. The two MFPs we included in this category are the Kyocera TASKalfa-5002i and the Kyocera TASKalfa-8002i, ranging in price from $3,000–$11,000, and varies between 30 ppm–80 ppm. Both of these MFPs are easy to use with exceptional image quality. On top of this, these devices are ideal for workgroups that need to use both digital and hardcopy documents to communicate. Scanning functionality allows documents to be captured and distributed via email and to a variety of digital destinations, based on integrated Kyocera business applications. To check out some of Kyocera’s business apps, read our blog, Boost Your Productivity and Save Money With These 9 Copier Apps. There is, even more, you can do when using the TASKalfa-8002i, like launching workflows, printing in color or black and white, and enhanced security (PDF encryption, user authentication, HID badge swipe access). If you’re interested in learning more about workflows and your office copiers, read an article published by Forbes, 3 Examples Of How Workflow Automation Improved Local Government. Finishing options include booklet/trifold and 7-bin mailbox. The touchscreen interface is customizable to your business, with a one-touch accessibility to most-used applications, helping you get more work done faster. The small form factor makes this device ideal for smaller offices and workgroups. The Kyocera TASKalfa-7052ci is a 70 ppm, and ranges in price between $7,000–$25,000+. This Kyocera copier has an easy, “walk-up copy and scan” functionality with a 9-inch color touchscreen. The scanner can route documents to nearly any destination, such as the cloud, email, or, a network folder. An important tool in document management for any size business. This reliable copier is a “workhorse” for your office, and mobile printing decouples users from their desks. The EFI Fiery Controller also allows fine-tuned color fidelity. So, why is there such a range in the price for many of these office copiers? It’s simple! You can add-on and customize many of these devices with more paper trays, finishing options, security features, and applications. It’s just like your smartphone or tablet. These and other document solution options help you configure your equipment to meet your exact needs. To learn more about the add-ons and extra features for your Kyocera copiers, read our blog, How to Use a Copy Machine: Basic and Advanced Features. At AIS, we strive to answer the questions that not just our current customers are asking, but our prospective customers are asking as well. Our goal is to equip you with the newest and most helpful information when it comes to your office solutions and business technology systems, based on your business needs and goals. If you’re interested in learning more about office technology, reach out to one of our business technology consultants, here. We’re here to give you peace of mind, and to help you win more business.